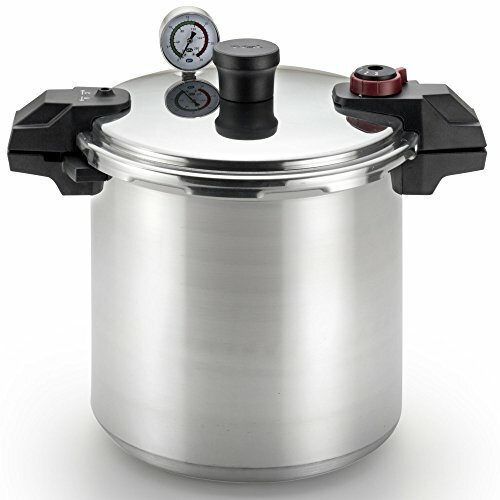 T-fal Pressure Canner, Pressure Cooker with 2 Racks and 3-PSI Settings, 22-Quart, Silver, Model 931052. With its roomy 22-quart capacity, this T-fal polished-aluminum pressure cooker and canner offers exceptional convenience in the kitchen. By combining heat, steam, and pressure, it efficiently cooks a wide range of healthy, delicious, home-cooked meals in a fraction of the time-up to 70-percent faster than conventional cooking methods, without losing essential nutrients or flavor. Cook for a crowd, create large batches for make-ahead meals, or capture summer's bounty for enjoyment year round by canning fruits and vegetables. When canning, the cookware can hold 16 pint-size jars, 26 half pint-size jars (when double stacked) or 7 quart-size jars at a time. The stovetop cookware's heavy-gauge aluminum construction heats quickly and offers rustproof performance for long-lasting use. Choose from three cooking-pressure options--5, 10, or 15 PSI. The cooker's selective pressure control maintains a steady internal pressure, while its vent tube in the center of the lid allows for proper steam release. For added safety, the cookware's backup steam-release components include a reusable overpressure plug (the red pin in center pushes out, releasing steam), and if more release is needed, the cookware's gasket-release window will push out from the lid opening. In addition, a spring safety device prevents the pressurization of the cooker before being securely closed, and a sure-locking lid system prevents opening the lid when the cooker is pressurized. A cooking rack comes included to prevent food from sticking to bottom and to raise jars up off bottom, along with a user guide with recipes for getting started. The T-fal 22-quart polished-aluminum pressure cooker and canner makes a great choice for novice and experienced cooks and canners alike. Cooking rack and recipe book included; limited warranty (10-year canner; 1-year replacement parts). Suitable for Gas and Electric Coil Stovetop only.